Did you know that pumpkin can replace eggs and oil in a cake? I found this recipe this past fall. I love this recipe for an autumnal dessert that is not traditional. I think I brought it to at least 6 different occasions throughout the holidays. I love that the ingredients are all shelf stable, has some nutritional value, and is lower in fat than your traditional sheet cake. The one thing that suffered a little was the texture, and I've found adding a little bit of water make a lighter cake. But seasons change, and it's not really spring like to bust out a pumpkin cake right now, is it? I did some research online, and I found several sources saying that you could put pumpkin into chocolate cake, and it was less pumpkin and more chocolate...I thought this was a win! Just think, healthy chocolate cake...it sounds like heaven. The recipes I could find only addressed a plain cake. It seemed counterproductive to me to create a nice cake and then just top it with some canned icing. I'm sure there are recipes out there that have some yummy solution, but I wanted one all my own. So how to make a chocolate cake better? Add more chocolate!! 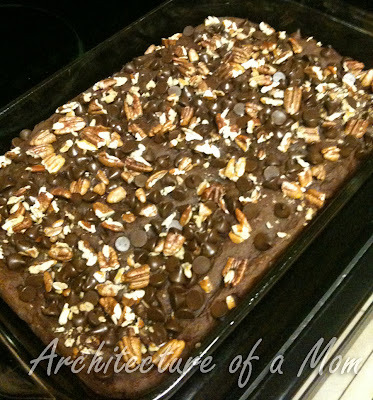 Once the batter is made and put into the baking dish, I pressed chocolate morsels and nuts into the batter. For a even more decadent option, once the cake comes out of the oven, you can drizzle melted white chocolate onto it. Preheat oven to 350. Spray a 9x13 glass dish with cooking spray. Put cake mix, pumpkin and water into a bowl. Use mixer to mix completely. Mixture will be thicker than your usual cake batter. Spread evenly into the prepared dish. Scatter chocolate morsels and nuts onto batter and press gently into the batter. Bake for 40 minutes, or until a toothpick comes out clean. If you want to make it triple chocolate cake, add the white chocolate almond bark. Melt the almond bark in a double boiler or the microwave according to the instructions on the package. drizzle the melted white chocolate onto the cake.